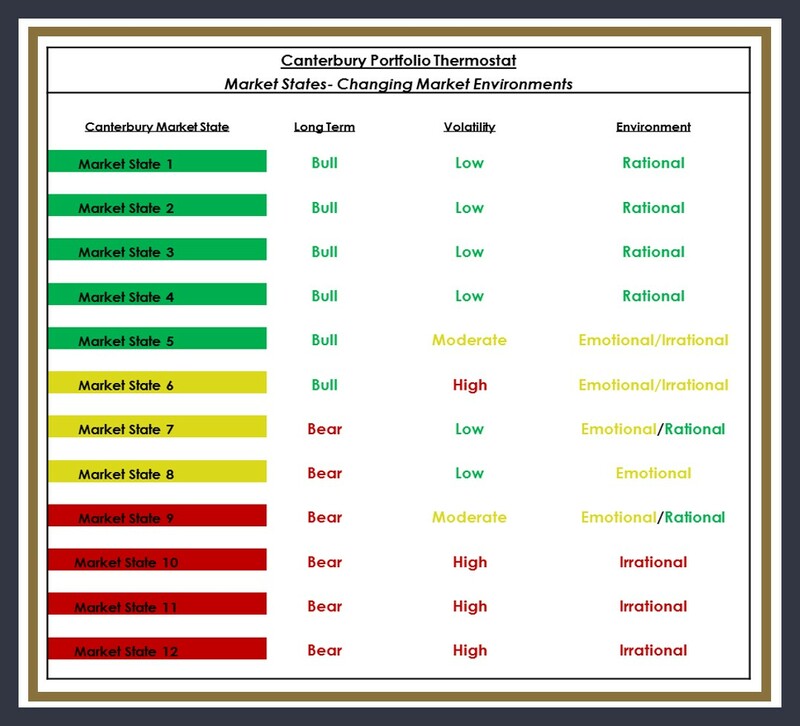 Market State 2: Bullish (14 trading days): Market State 2 represents a low risk bullish market environment. The S&P 500 has been consolidating its gains for over a month. Short term risk should be limited to random fluctuations of 4% or less. Below is a chart that shows the different Market States that Canterbury has identified. Canterbury Volatility Index (CVI 40): Volatility is near historically low levels. Low volatility is a bull market characteristic. It shows that diversification is working and that markets are trading efficiently. 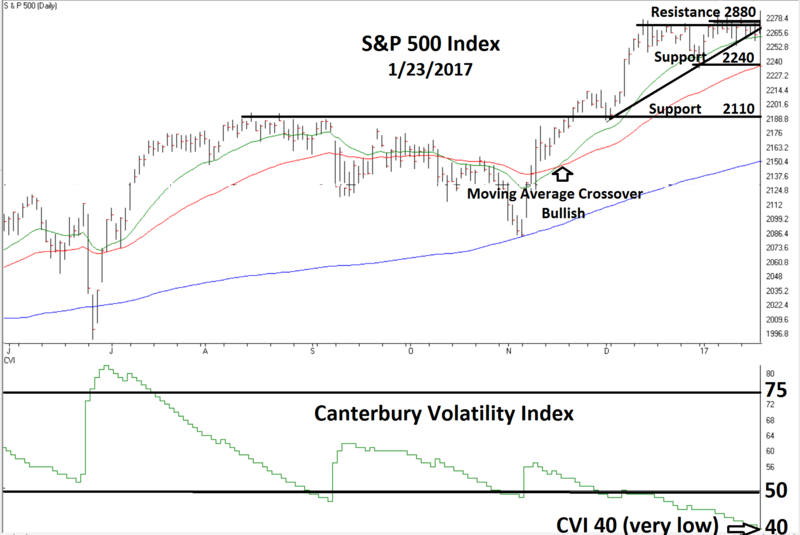 Canterbury’s studies show that the market’s optimal volatility range is from CVI 75 to CVI 50. The current CVI 40 is at an extreme level. Periods of extremely low volatility are typically followed by single day outliers that can exceed 1.75%. Thus the analogy of squeezing down a spring and then letting it go to release the pressure. Our studies show that the outlier days are more typically down as opposed to up. The current period may have a higher probability of a breakout to the upside. I will explain why starting with the following chart of the S&P 500. The S&P 500 has spent the last five weeks consolidating (digesting) the sharp advance that began near Election Day. The market has been moving sideways without a meaningful pullback in price. We would consider this to be a positive event. An outlier day, or two that could decisively break through the 2880 resistance would be very positive. The NASDAQ is outperforming the S&P 500. 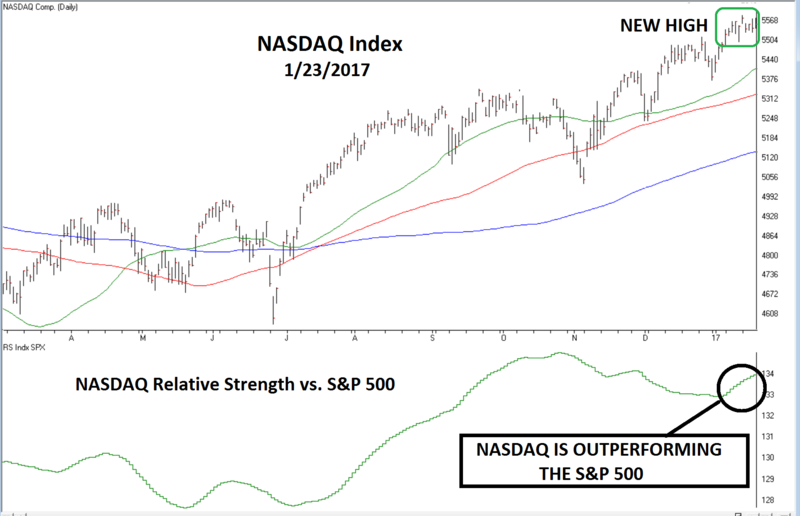 Our studies show that the investment climate is typically better when the NASDAQ index is the leading performer. “Safe” Treasury bonds don’t look so safe. 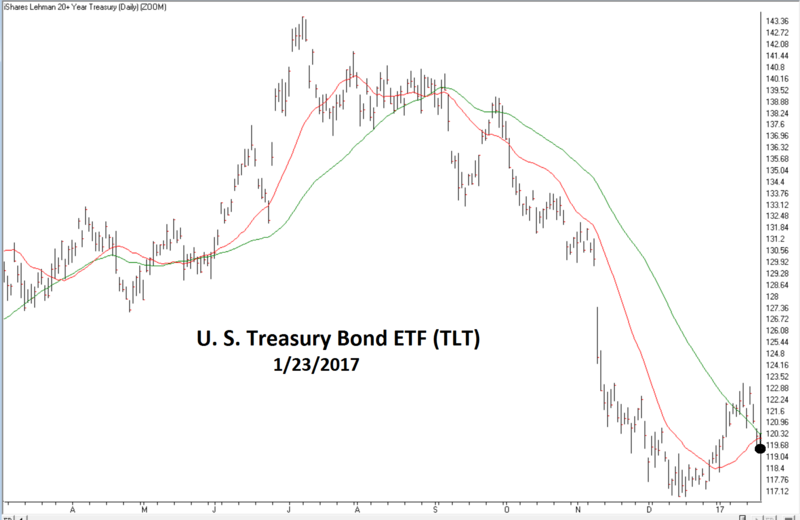 The U. S. Treasury bond ETF (TLT) remains in a bearish/transitional security state. Don’t assign risk labels to asset classes; i.e. bonds are safer than stocks. All traded securities will experience bull and bear markets. No asset class that is displaying bearish characteristics can be considered “safe”. Markets are not driven by short term events. So don’t get caught up in all the political rhetoric. The current environment is an excellent example. Rarely has there been so much noise, unknowns, and hype with volatility near a historic low. Portfolio management is all about an efficient process to adjust holdings and match the realities of what the markets are actually doing, not what expert opinions think they should be doing.